Nothing else than the Italian speaking version of the Speak & Spell (Type 3) with a different voice. Don't miss the German Buddy and the French La Dictée Magique. 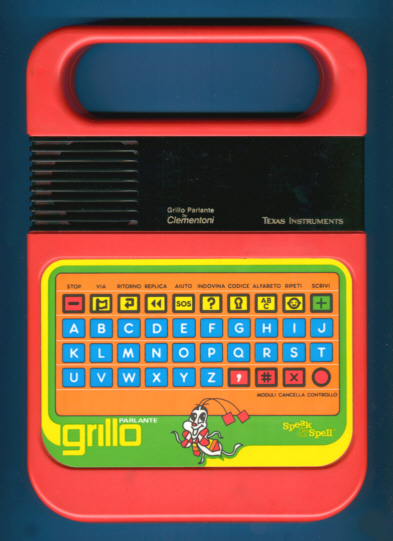 The pictured Grillo Parlante was distributed in the 80s like some other Texas Instruments products by Clementoni. Most Grillo Parlante and all Dotto Contaparla on the Italian market seem to be from Clementoni. Microcontoller: The microcontroller is derived from the TMS1000 series and adopted to control both the keyboard, the display and to feed the speech synthesizer. This Grillo Parlante uses a CD2702 which interprets as TMC0270, ROM-Code 2. Speech Synthesizer: The Speak & Spell series uses with the TMC 0280 the first one-chip LPC speech synthesizer. Later refinements to the Speak & Spell chips resulted in the TMS 5100, 5200 and 5220 Voice Synthesis Processors for commercial products. This Grillo Parlante uses a CD2801 which interprets as TMC0280, Version 1. Speech ROM: Speech data is stored in a 128k ROM chip with the designation TMC 0350. This Grillo Parlante uses a CD62190 which is actually a double VSM (Voice Speech Memory) with 256k capacity. Thanks for the correct date of introduction, Beatrice ! © Joerg Woerner, June 20, 2003. No reprints without written permission.